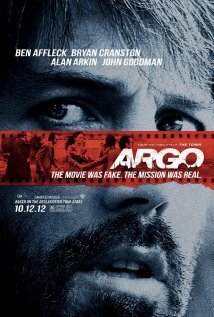 Argo ahead and see it. We should be happy for Ben Affleck. Gigli and Daredevil were steaming mounds of terrible decision-making, and since then the popular opinion was that the boy wonder who fourteen years ago cutely dreamwalked on stage with Matt Damon to receive a screenwriting Oscar for Good Will Hunting, had officially had it. The reason? Who knows. Hell, it may have been a bout of insanity that made him inexorably pair up with a J-Lo who orated ‘it’s turkey time’. And then from nowhere, Gone Baby Gone came round in 2007, his first behind the camera; praise was fired from the rooftops at Affleck. Next was 2010’s The Town; intimate love letters from film critics silently flew in through Affleck’s window while he slept, practically. It seemed we had our wonderboy once again; it was like welcoming back an estranged brother who went awry and joined a cult or something, only to return home to the dinner table with the plates and cutlery set just as mother left them. If Gone Baby Gone and The Town were starters, dinner, it seemed, was Argo. This is Affleck’s first foray from his comfort zone, at least geographically: you won’t find any mawtha-o’gawd drug cartels here. The mostly exotic Iran is in revolutionary upset in the last ’70s and early ’80s when a group of American operatives are taken into hiding to prevent a disastrous hostage situation. While they’re in lockdown, the CIA are desperate to find a plan to get them out – and have a particularly slim number of options. It’s when Tony Mendez (Affleck), experienced op, has an inevitable eureka moment: create a fake movie. Of course. Create the hype, the costumes, the script – and make out the insurgents are its film crew. As Bryan Cranston’s Jack O’Donnell says at one point, ‘it’s the best bad idea we have, sir’. The film itself – no, not the fake one, this one that’s being reviewed – lives up to this beautifully absurd premise; Affleck’s knack for tight plotting and intelligent pacing is what makes a good thriller, especially a potentially dense one like this. Not only are the period details spot on, but the general hues, mannerisms and moustaches all smack of the late ’70s, and Chris Terrio’s sinuous writing thankfully measures up to Affleck’s eye for visual detail; Argo is multi-layered yet with a perpetual forward drive, inherent with a sense that it’s all leading to one inevitable. cataclysmic point (happening to be a daring, hyper-tense airport climax). 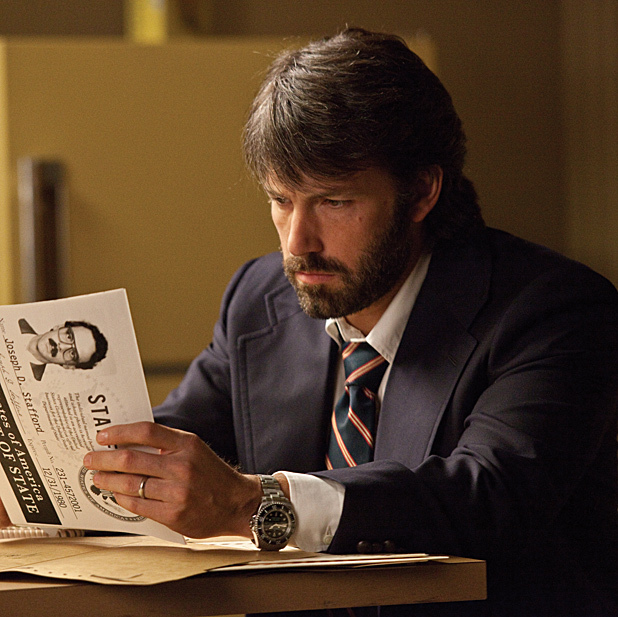 Every member of the supporting cast fits their roles like a charm, and it’s the moments of character that gives Argo its true sense of purpose; John Goodman as real-life special effects artists and Alan Arkin as fictional producer both nab most of the best lines – yet the only nagging letdown is Affleck’s choice of casting himself in the lead role. While he brings not much but a vague puppy dog-look on emotional cues, it’s actually a fault of Terrio’s writing; a wafer-thin subplot between him and his family just can’t help but feel shoehorned into the thoroughfare in an attempt to substitute the basis for an arc that simply isn’t there. This kind of careless handling does mean the movie is mounted on an impersonal, less emotional impetus – yet Affleck’s deftness here is in weaving finely crafted suspense. Every moment is so taut with relentless tension, that the nitpicking almost doesn’t matter. For instance, a standout moment is when the faux film crew make their first journey across a town square bursting with uprising, and their identities are put in danger of being uncovered; only gifted directors can get you on the edge of your seat by simply watching a van roll across a road at less than 1mph. While Argo succeeds with the best of ’em on these more crucial levels, there still feels as if there should’ve been more meat on the bone. The opening and closing sequences are both masterclasses in gradual, one potato-two potato layered storytelling, and manage to vamp up the tension to leg-quivering heights. However, while there are mainly fantastic scenes between, the promise of their fake movie never feels entirely satisfied – a scene where a glamourous in-costume press junket is held is brilliant, especially in its intercutting with the horrendous siege happening in Iran. But then again, that’s not the point of the film – Argo is refreshingly meta-free, not metaphor, and any notions of cinematic dissection are laughed out the window purely because of the importance and articulacy of the actual story taking place. Ben Affleck’s finished his meal at the table he’s returned to, warm in the glow of praise-spouting company and with bad memories (skin-tight red suits) far behind him. Luckily, it hasn’t gone to his head so far; Argo isn’t a product of a man obsessed with making pictures to be simply noticed or accepted. He wants you to be involved, invested, excited, terrified: this mostly excellent political thriller extolls all of those virtues. Wonder what he’s having for dessert?